It’s beginning to feel a lot like… rafting season! 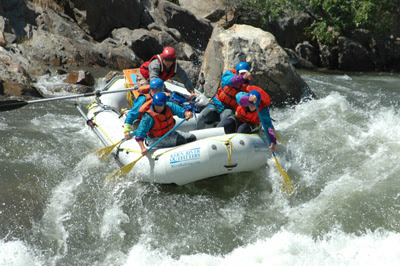 Home/Kern River Forks Rafting Whitewater Trips Vacations/It’s beginning to feel a lot like… rafting season! We are just a week away from our season-opening trip on the class V Forks of the Kern and we are just itching to get on the water. Our guides are starting to filter back into Kernville to get ready for the upcoming season. Like a kid before Christmas, everyone at Kern River Outfitters is just trying to fill the time with productive chores: checking equipment, buying rolls of duct tape (a guide’s best friend), and, of course, telling each other river stories from seasons in the past. Now is a great time to book a “Forks” trip with KRO. Our first Forks trip launches May 6 and from then on we launch every five days. On May 16th, May 31st, June 5th and June 15th our prices have been reduced to $798. Call us at 1-800-323-4234 to book your Forks trip today. We all hope you can join us for another exciting season on the Kern. By Matt Volpert|2016-10-24T22:47:18+00:00May 1st, 2007|Categories: Kern River Forks Rafting Whitewater Trips Vacations|Comments Off on It’s beginning to feel a lot like… rafting season!